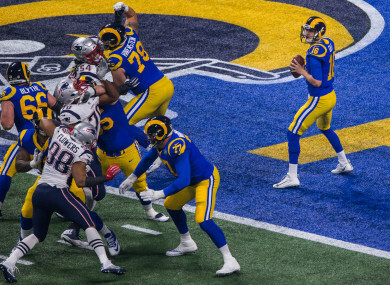 The LA Rams against the New England Patriots in the Super Bowl earlier this year. THE FIXTURE DETAILS for the NFL games taking place at Wembley and Tottenham Hotspur’s new stadium later this year have been revealed. It was confirmed in January that four international games would be coming to London this year, with two of those fixtures now billed for Spurs’ home ground. The first game will see the Chicago Bears take on the Oakland Raiders on Sunday 6 October. That will be followed by a clash between the Tampa Bay Buccaneers and the Carolina Panthers on Sunday 13 October, where the Panthers will be making their first appearance in the UK. The other two NFL games will be staged in Wembley. First up is the meeting of the Cincinnati Bengals and the 2019 Super Bowl finalists the Los Angeles Rams on Sunday October 27. The Jacksonville Jaguars and Houston Texans will then battle it out in the other fixture on Sunday 3 November. Mexico City’s Azteca Stadium will host the other international game, where the Los Angeles Chargers will take on the Kansas City Chiefs on Monday 18 November. Carolina Panthers @ Tampa Bay Buccaneers in Tottenham Hotspur Stadium — 13 October, 2.30pm. Email “Fixture details confirmed for 2019 NFL games at Wembley and new Spurs stadium”. Feedback on “Fixture details confirmed for 2019 NFL games at Wembley and new Spurs stadium”.